Google Search's search filters can be a useful tool when you research something on the Internet. They enable you to limit results, for instance so that only video, news or image results are displayed. While Google won't touch those major ones, it appears that the company has removed several "lesser" used filters of the "More" menu from its search engine. When you click on the more link right now, you will notice that only four or five options remain, instead of the ten that were displayed previously. Gone are for example blogs, discussions, recipes, patents or places. The remaining options may be shuffled around as well now, so that one entry that you found listed under more may now appear on the main bar directly based on your search query. Users who have made use of the discussion filter on Google are complaining about the removal on Google's product forums. So what does the discussion filter do? It limits search results to discussion forums mainly. If you perform a discussion search, you end up with a list of forum results only that you can go through. Other types of results, e.g. blog results, news sites or social sites, are filtered from the results. The blog and places filters work in a similar fashion. They filter out all results but the desired one from search. While the discussion option has been removed from the search filter list up top, it has not been removed from Google Search itself, at least not for now. While this can happen anytime, the following ways allow you to search for discussions on Google Search right now. This is probably the most reliable option right now. Instead of loading the main Google Search homepage as your entry point for your search, you load the Search Discussions page instead. You can also search for discussions indirectly, meaning from any Google search form, by appending discussions to the end of the query. If you want to search for forum posts about Microsoft's upcoming operating system Windows 9, you can do so by searching for "Windows 9 discussions" on Google. Note that this does not work all of the time. If it does not work, append &tbm=dsc to the query to enable discussions search. Once you do, you will notice that Search tools lists "All discussions" here as an option which you can use to filter by forums or questions & answers sites. To get blog search back, use the following entry point. It enables the Search Blogs option right away so that you can search for blogs on Google without having to worry about any of the other results that Google may throw at you. Load this page to search for places directly. It works just like the blog and discussion searches, meaning that all other results will be filtered out by Google so that you end up with nothing but places in the results. This is awesome.. testing the trick now.. Thanks for sharing the tips. I use the Discussions filter for at least 50% of my queries, to good effect! Thanks for the workaround. I sure hope it’s only temporary and some idiot at Google has lost their job or been repositioned. I thought someone might have created a Firefox search engine dropdown but I didn’t land at the usual visual list of available engines at http://mycroft.mozdev.org/ and manually going there it was timing out. Looks like just a handful of lines of code would work. Any volunteers ? http://mycroftproject.com/search-engines.html is working but you don’t go there automatically any more. Wow that’s just nuts, I use the Discussions filter for more like 90% of my searches. Product reviews for something you cant find on amazon? Discussions filter or you’ll get all vendor sites. Stuck on a video game? Discussions or same deal. Trying to figure out the meaning of some artsy fartsy movie? Discussions or you’ll get all movie reviews or unrelated stuff. Anything concerning pretty much any band or music related issue? Discussions or you’ll probably get a malware site. Google has made a lot of infuriating moves the past couple years, but this is by far the most unwarranted and frustrating. In the Summary section, the URL in the hyperlink for Blogs is accidentally the same as the one for Discussions. You need to change the last part of the URL from “=dsc” to “=blg”. 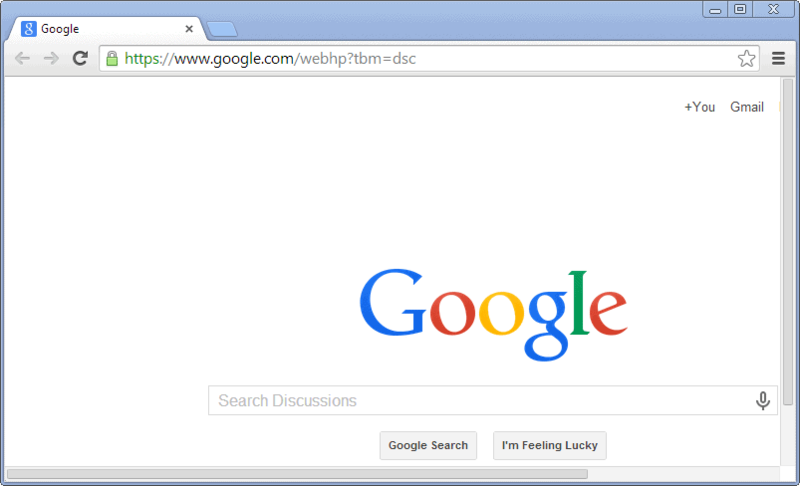 Then, to do a blog search in Google, for example, just type “blogs [search text]” in Firefox’s Address Bar and hit Enter. It’s a quick way of doing specialized searches in Firefox. I’ve used it for Google News and Images for a long time. It hasn’t worked in Google Maps for quite a while (at least not in the “old” version of Google Maps, which I went back to; I don’t think I stuck with the “new” version long enough to try making a quick keyword search for it). And in case anyone’s interested, it doesn’t work for Google Translate, either. This is indeed great thanks. I fear tho since this issue has had so much publicity that google will remove the underlying code instead of just the drop down menu. Thank you so much! I was very disappointed that the blog filter was gone – thank you for posting a link to it! Thanks for this tip Martin – useful ! How do you get this kind of information? By monitoring Google developers forums ? Try adding the word “Discussion” to your search terms to limit results to discussion forums. Does a pretty good job. thankyou :) plz spread message.